A song to play while you read about the Mariners: Built to Spill – “Never Be The Same,” because Jerry Dipoto’s team today will never be the same as it was last week. On the surface, the 2018 Seattle Mariners (89-73) season was not one that would typically result in the General Manager selling off nearly all valuable assets the following offseason. However, their season was one of fortuitous sequencing. The team outperformed its Pythagorean record by 12 wins (a number twice that of the next team) and its BaseRuns record by 8 wins (second only to the Red Sox). A seemingly solid first half record of 58-39 positioned them in second place for the A.L. Wild Card. Following the All-Star break, the luck ran out and the blessed touch of the Sequencing Gods was nowhere to be found, leading the team to a more fitting sub-.500 record in the second half of the season. To his credit, Jerry Dipoto did not try to extend the window of contention as had been done following the previous handful of seasons. As it stands, the American League is extremely top heavy and the Mariners roster following the 2018 season was unlikely to overthrow the AL juggernauts in Houston, Boston, and New York. Thus, this offseason was one that saw Seattle forego immediate success, focus on a few years in the future, and cash out (most of) their remaining chips. Four of the team’s top contributors including James Paxton (3.8 WAR in 2018), Jean Segura (3.8 WAR), Edwin Diaz (3.5 WAR), and Robinson Cano (2.9 WAR) were shipped out in exchange for pieces that could be parts of the next Mariners core. New acquisition Justus Sheffield had a tiny sip of coffee in the big leagues with the Yankees last season and is in line to be a member of Seattle’s rotation for a good chunk of 2019 and beyond. J.P. Crawford, a former top ranked Phillies prospect, had injury issues in recent years and Seattle is hoping regular playing time (once his service time is sufficiently manipulated) will bring out his potential. Jarred Kelenic and Justin Dunn are two former Mets first-round draft picks. Kelenic is a few years away but is projected for an above average hit tool and raw power. Dunn has three plus pitches and put up a 10.54 K/9 rate and a low-3.00s FIP in 89 2/3 innings at Double A last year. 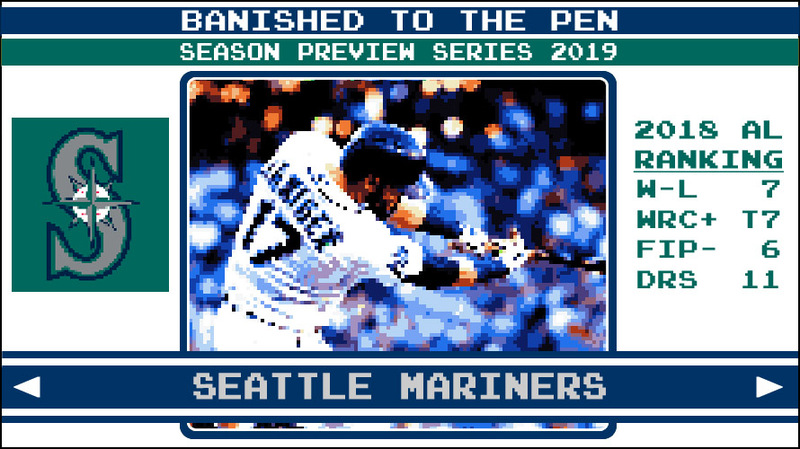 The Seattle Mariners are projected to be a sub-.500 team in 2019, but there are still reasons to stay tuned in. The organization has six players on Eric Longenhagen and Kiley McDaniel’s 2019 Top 100 Prospects list at Fangraphs (Sheffield, Kikuchi, Kelenic, and Dunn, along with Evan White and Shed Long). The future may not be as bleak as it sometimes seems in Seattle, for Jerry Dipoto has steered the ship in the right direction this offseason. What is the Mariners’ most recent accomplishment? Signing Yusei Kikuchi. While the team missed out on Shohei Ohtani, the signing of Kikuchi allows them to remain relevant and watchable (at least every fifth day). More importantly, the signing further establishes the time-honored connection between the Seattle Mariners, Major League Baseball, Nippon Professional Baseball, and Japanese baseball fans. This is a tradition that began with Makoto Suzuki in 1996 (the first Japanese player in the AL), hit its stride in 2001 with Ichiro Suzuki, and will persist in 2019 and beyond with Yusei Kikuchi. How will the Mariners define success in 2019? Success for this Mariners team will be defined based on how their new acquisitions perform and on the quality of return they get in potential deadline deals (Mitch Haniger should not be buying property in Seattle anytime soon). This is a team that is eyeing success in 2020 and beyond, so 2019 will be an important stepping stone in the development and establishment of its potential future core, including new acquisitions Justus Sheffield, J.P. Crawford, Jarred Kelenic, and Justin Dunn. In 2017, Domingo Santana’s only full MLB season, he slashed .278/.371/.505 for a 127 wRC+ and played below average defense according to DRS and UZR. He did not have a full-time role in the Brewers outfield in 2018 and in 235 plate appearances slashed .265/.328/.412 for a 97 wRC+ and was above average defensively. What could explain this? Changes in his batted ball profile from 2017 to 2018 could warrant a chuckle during an Effectively Wild discussion. He hit the exact same proportion of fly balls in 2017 and 2018 (27.7%), but his HR/FB percentage plummeted from 30.9% (right behind J.D. Martinez) down to 13.2% (right behind Mitch Moreland, minimum 230 PA). In 2018 his plate discipline also changed: He saw more pitches outside the strike zone (60.1% vs. 55.8%), swung at those pitches more often (30.9% vs. 26.5%), and made contact on those pitches less often (48.2% vs. 51.9%) compared to 2017. Santana should have a full-time gig in Seattle this year and the team is hoping he can show off the offensive upside displayed in 2017 while maintaining the defensive gains displayed in 2018. If there is one can’t-miss Seattle Mariners game in 2019, it is June 21 against the Baltimore Orioles. While the quality of the opponent might not be a selling point, the prospect of obtaining one of 10,000 Lou Piniella “Lou-Au” Hawaiian shirts most certainly is.